The bluegill, Lepomis macrochirus, is a popular sport fish that is not native to Utah, but is now found throughout the state in warm water habitat. The native range of the species includes much of central and eastern North America. The bluegill is an opportunistic feeder that eats small fishes, zooplankton, insects, insect larvae, and other invertebrates. The species spawns in the spring and summer, with eggs hatching in about two days. Males build nests prior to spawning, and later guard eggs and newly emerged fry. Bluegill are found in warm shallow areas that offer sufficient cover, usually in the form of submerged vegetation. Utah offers some excellent bluegill fishing opportunities. Pelican Lake, formerly a popular bluegill fishing location in Uintah County, is once again beginning to produce large bluegill in good numbers. Bluegill are shorter, deep-bodied fish, whose name comes from the dark flap over the gills. The body is olive-green with vertical bars, and some blue and orange may be present. Bluegills can be caught by using worms or insects on a small hook, and will also take your small jig or fly. Green sunfish are brassy-green or blue-green on the back, sometimes with metallic-green flecks and dusky bars on the sides. The flap over the gills is a dark color. This fish will strike at worms, bait or smaller artificial lures. 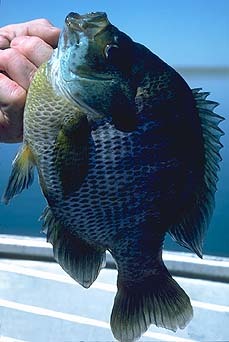 It is often very difficult to distinguish between Bluegill & Green Sunfish, especially when they are very small. In fact, it is possible that there is interbreeding between the two species when present in the same water. The nice thing about fishing for bluegill and other sunfish, is that usually the only thing you need to do to have success is to locate a school. If you can do that, then usually just about anything small you throw at them will catch fish.